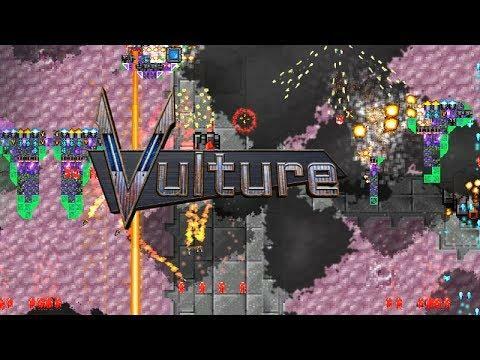 The shoot 'em up game Vulture, which allows you to build your ship block by block has a fresh update out adding in local co-op support. It's a genre that has a lot of competition, with so many fantastic shoot 'em ups out there it's hard for any to really get noticed. Which is why it's nice that Vulture does things at least a little differently. Instead of choosing between ships, you build your own! Added player 2 controller configuration to options menu. Sadly, it does have a major issue on Linux. They're using an older version of Unity that has broken input on Linux. A well known issue by now, so I've let them know (also tweeted it to them). Essentially, you hold down a button and it repeatedly switches between being pressed and not pressed—very annoying. It does have mouse support, so you're not forced to use the keyboard. However, mouse control is pretty weird as your mouse is not attached to the ship, instead your ship chases the mouse cursor around. It's weird and I'm not a fan of that, it would be a lot better to just have the mouse be the ship. You can find it on Steam, although I would wait for a patch to fix the keyboard input. I told them about horrible controle several months ago, and sadly it's still horrible. "let them know" link doesn't work for me. Looks like a nice game. I'll wait for the input issue to be fixed. Thanks for the warning! barab4 "let them know" link doesn't work for me. Works fine for me, just a standard link to a Steam post.